We created a refrigerator magnet that helps remind people of what actions they should be taking after a dog bite incident. If you would like one of these free magnets, we will be happy to send you one. Simply contact us by calling 1-888-998-9101 or send us a website message. If you, your child, your spouse, or other loved one has been attacked and bitten by a dog, don’t procrastinate even if you think the wound looks minor. As further explained below, you need to seek medical attention, you need to contact the proper authorities, you need to file the necessary reports, and you need to document everything related to the dog attack. Immediately contact your medical doctor or go to your local emergency room or medical clinic. If the wounds are severe, this is an obvious action to take. However even if the wounds appear to be minor, you still should seek immediate medical attention. Dog bite wounds can easily become infected if not treated properly and you simply don’t know whether the dog has been adequately vaccinated throughout its life against diseases like rabies. Get in touch with us by calling 1-888-998-9101, send us an email at [email protected], chat with one of our 24-hour live representatives here on our website, or send us a message by filling out and submitting our contact form. We will help you obtain the names of local agencies that must be notified including: police departments, dog wardens, and health departments. There is no cost whatsoever when you contact us. When you contact your local police department and dog warden, they will create an official report and take appropriate follow-up action with the dog’s owner, harborer, or keeper. When you contact your local health department, they will start a process to verify the dog received rabies vaccinations and may require the dog be placed into a quarantine period to monitor for signs of rabies. If legal action is necessary, you will need records. Therefore, we highly recommend that you keep a log or journal and write down everything including things like: what you or the victim was doing immediately before the attack, where the attack took place, description of the dog, the medical treatment received, pain experienced, contact with the dog’s owner, missed work or school time because of the dog attack, and other details. Write down all the dog owner’s, harborer’s or keeper’s contact information including his or her telephone numbers, home address, email address, etc. Also keep the contact information for anyone who witnessed the dog attack. If you have questions about the definition of a dog’s harborer or keeper, please visit this link. Take clear, easy-to-see, photographs of the injuries immediately. The camera on almost any smartphone works great for this. 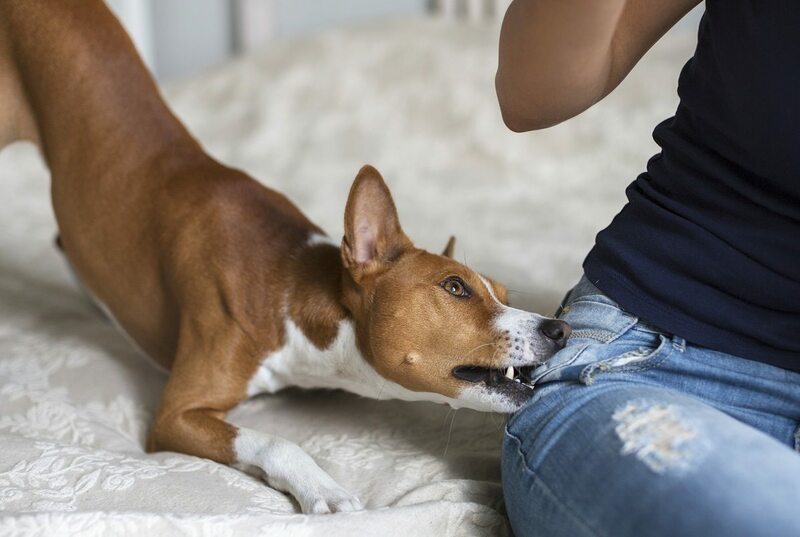 We offer victims of dog bites in Ohio, free consultations with one of our experienced attorneys. A free consultation with one of our attorneys is just that – free. There is no cost whatsoever and you will be under no obligation to hire our law firm. During your free consultation we will review your case, answer your questions, and provide you with guidance. We offer you a variety of ways to get in touch with us. You can call 1-888-998-9101, chat with one of our 24-hour live chat operators, send us a website message, or download our APP on your phone and keep us just one touch away at all times. 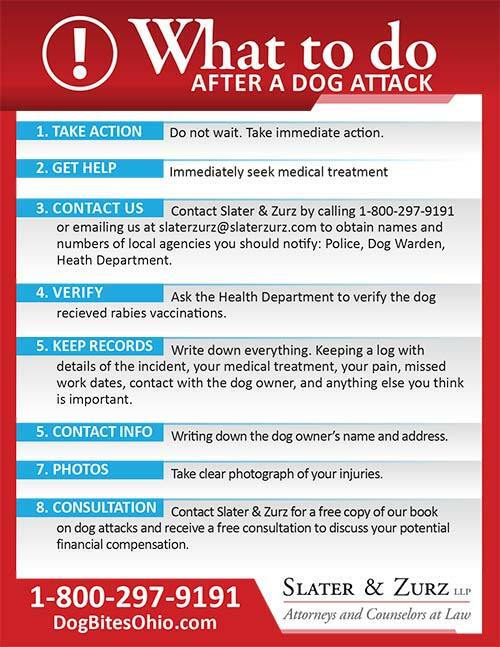 We encourage you to follow this checklist of what to do if bitten by a dog. It will help you both now and, in the future, if you need to act and recover compensation for your injuries and damages. We also invite you to explore this website that’s dedicated to helping victims in Ohio who have been attacked by a dog. Make sure to request a free copy of our book When a Dog Bites Fight Back, What You Need To Know What You Need To Do What Not To Do.